Is it just me, or does that picture make you also want to be backpacking? This series of gear posts have partially been to show how inexpensive backpacking can be, but this is one item where I was able to silence my typical thriftiness. 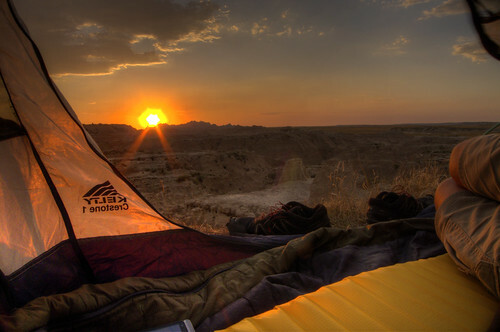 The comfort of that yellow sleeping pad contributed a lot to that sunset in Badlands National Park. So, whether I'll be sleeping in a tent, hammock, or shelter, I bring along a sleeping pad. In the hammock, it's more for insulation than comfort, so if it's very warm, I can go without it. Otherwise, it's always with me. Since I've been spending such a large percentage of my year sleeping on the ground, I justified buying the most expensive sleeping pad there is, the Therm-a-Rest NeoAir XLite. I didn't actually fact-check that statement, but I've never seen anything more expensive. 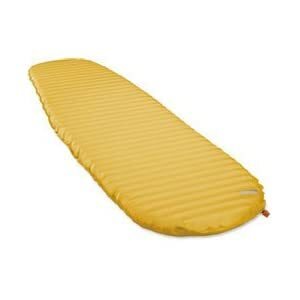 It was especially expensive when compared to my first sleeping pad, a $6 piece of blue closed-cell foam from Wal-Mart. 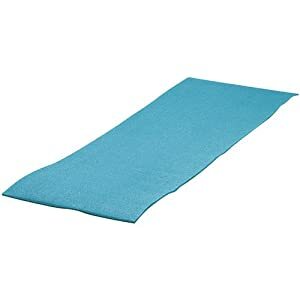 Before my first trip, I cut the blue foam mat down to torso length, to reduce its weight to 8 oz. That got me by just fine on my first few backpacking trips, but I didn't sleep very well and woke up with a sore back. Once I realized I was in love with life on the trail, and knew I would be doing a lot more of it, I decided to upgrade to a torso length Therm-a-Rest ProLite (11 oz.) for around $80. Later, I realized that torso-length pads with my legs hanging off the end made me colder at night, so I needed a warmer sleeping bag to compensate. That meant I wasn't really saving much weight. So, I regretted that purchase. Since I'm cheap and reluctant to add more ounces to my pack, I stuck with that pad for a few years. Until one morning when I woke up to the sound of a dog chasing a cat. I had been couchsurfing with someone in Vermont when hiking the Long Trail. I felt her dog and cat run across me and my sleeping pad. I fell back to sleep, but a few minutes later, woke up again when I realized I was on the hard floor. The animals poked a hole in the pad. I didn't care, though. One, I loved her happy dog and believed it could do no wrong, and two, I finally had my excuse to upgrade. The NeoAir XLite weighed about the same (12 oz. ), but was full length, three times as thick, and looked way more comfortable. Then I saw the price tag. "Oh snap, $160!?" What follows is a dramatization, loosely based on my actual decision-making process. The figurative angel and devil popped up on my shoulders, "Ryan, you're spending most nights outside, this is your bed now. It's okay to spend money on it," said the devil. "But Ryan, you're not working right now, you can't spend that kind of money," said the angel, who had a point. "Good sleep is better for your health," the devil interjected. "You'll be happier and live longer if you start sleeping better." "But it's $160, that's more than you spent on your real bed," said the know-it-all angel SOB who suddenly didn't seem to care about my well-being. "This cozy and warm NeoAir has an R-Value of 3.2, one more than your old sleeping pad," the brilliant devil said. "And it's only one ounce heavier than your other Therm-a-Rest, that you regretted buying, the one you wasted $80 on. You want to waste even more money by buying something else you won't like?" The devil just about had me convinced with the idea that I would be wasting money. He used my cheapness against me. "And," he continued, "The NeoAir XLite packs down to the size of a Nalgene bottle, that's simply unprecedented. We need this sleeping pad. Ryan..." He leaned closer to my ear and whispered, "We deserve this sleeping pad." "But Ryan," said the angel who, foreseeing defeat, collapsed to his knees and began to beg. "We could just patch your old one for next to nothing..."
"Oh shut up, angel, nobody likes you!" Which I'd like you to pretend I whisper yelled to my empty shoulder in the crowded outfitter. "And honestly, angel, I'm starting to question the very point of you? We need this to be happy and healthy, don't you see? It's as though you want us to die sad and bitter, because that's exactly what will happen if we don't buy this." Betrayed and alone, the angel vanished. I made my way to the checkout. Back in reality, what followed were weeks of buyer's remorse. The thickness of the pad seemed almost uncomfortable at first, and I missed the days of being able to throw my sleeping pad on the ground to sit on, without worrying about getting a hole in it. Every night, I was on the ground fastidiously removing every sharp rock before setting up my tent. I didn't exactly resemble Rick Moranis searching in his backyard for his tiny children in 'Honey, I Shrunk the Kids', but sadly, I can't say it wasn't similar. Eventually, I forgot about the money and realized I didn't have to be so careful with it. For its thinness it holds up pretty well. I also started using the sit pad that doubles as the back padding of my Mariposa Plus backpack, so I still have a worry-free thing to throw on the ground to sit on without adding more ounces. On my first night below freezing, I realized how much warmer I was. And once I figured out the right amount of air to blow into it for maximum comfort, I did sleep much better. For the first time, I could sleep through the whole night without waking up once. And so, I lived happily ever after. The End.